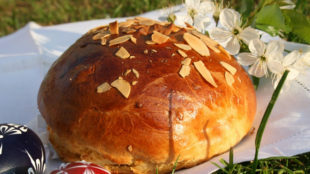 Lamb (Czech: beránek) is a traditional Easter bread, which you can bake many kinds of dough. From the rubbed, sponge, cream dough or even cottage cheese dough or marbled dough. Every family has its best recipe. Mix sugar, whole eggs, egg yolks and vanilla sugar until foam (about 30 minutes). Then add the lemon juice, stiff beaten egg whites, flour and gently stir. Form of a lamb grease with butter and sprinkle with flour. Pour the dough into it and bake until golden brown, about 45 minutes in 170-180°C. Tip the baked lamb carefully out and decorate with chocolate or only with sugar.